« Sufferrings due to a Healthy heart ! 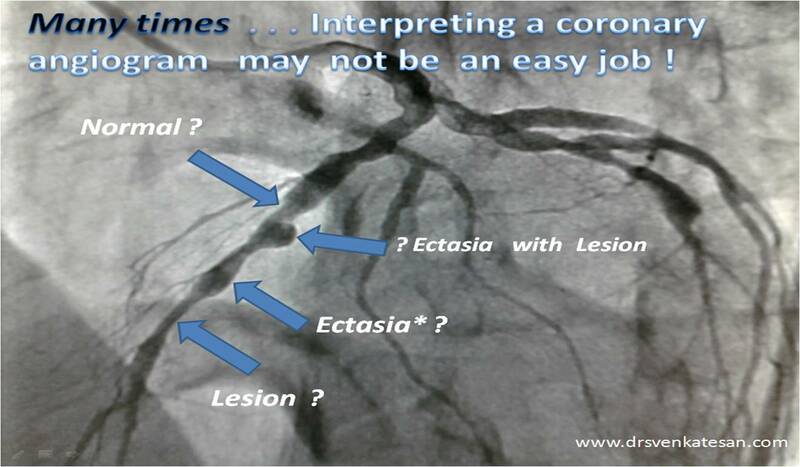 Why doing a coronary angiogram is much easier than interpreting it ! Coronary angiogram is probably the commonest invasive cardiac investigation done world wide. It should run into millions every year. The procedure once thought dangerous is now performed in few minutes in day care centers . While doing a coronary angiogram has become a minuscule task to most cardiologists, interpreting it correctly remains a huge task ! Many of the young cardiologists get fascinated in doing a coronary angiogram and hardly spend enough time and mind in interpreting it. Calling atherosclerois by numbers alone, such as 50 % LAD and 70 % diagonal 20 % left main is a huge insult to the deadly & diffuse disease process of atherosclerosis .We are paying the penalty for it .This is the fundamental flaw in our reporting , that makes every coronary intervention redundant.We must first remember we are looking at the lumen not the wall of coronary artery. Coronary interventions is not about removing obstructions but regression of atherosclerosis load within the coronary artery , prevent progression of it and ultimately reduced cardiac events and improve survival. It is obvious, it can not be achieved by wires and catheters alone . At best they can be adjuncts.One can easily understand why medical therapy scores over wires as it can take care of the overall disease process. But still , most* of the learned cardiology community considers medical therapy to be an adjunct to coronary intervention , which is a gross ignorance at it’s best ! * This is my perception. If I am proven wrong , I am happy our patients will be benefited ! Do not reduce the importance of coronary angiogram to a farce number game ! Do not get excited by visualizing your patient’s coronary artery. It may make you richer by few thousands. Realise , what you are seeing in a CAG is a fraction of coronary circulation. It is estimated coronary circulation we visualize daily in cath lab as epicardial coronary arteries is less than 2 % of entire cross section of coronary circulation. This means we are 98 % blind ! ( or 2 % wise !) .Spend adequate time and mind to interpret it correctly , so that logical and useful ( non ) interventions can be done .This only can make you a true cardiac professional and your patients will respect you.